It has been so busy around Helen O' Grady Asia and we have many experiences that we wish to share with you! One of our most recent event is our 5-days camp at Sacred Heart Primary School (Taipei). 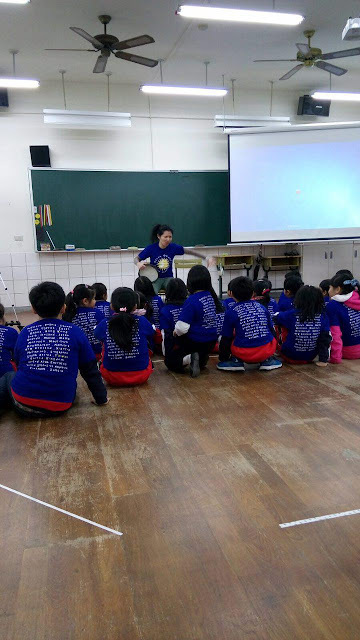 Teacher Francine had the privilege to travel to Taipei for 5 days to teach the little ones how to express themselves through our interactive drama programme! With the stage marked out, Teacher Francine rallied the excited students together.! Everyone was wearing the Helen O' Grady t-shirt and embodied the fun-loving and enthusiastic HOG spirit! 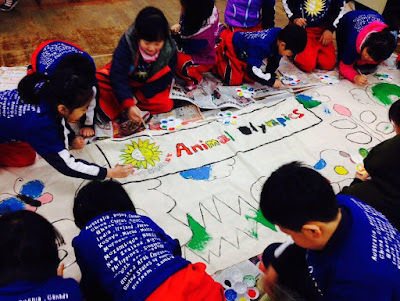 Besides the segment on drama, the children rolled up their sleeves and got down to painting on a cloth banner! They imagined what it would be like if the animals came together to compete in an Olympics game! They painted Mr. Lion, other animals and many other landscapes such as mountains! We truly had a great time at Taipei and we hope to see them again soon! As the Chinese New Year approaches, all the staff of HOG Asia would like to wish Sacred Heart Primary and everyone a prosperous and blessed CNY!